Had to return because colors didn’t match but overall nice set. Update your bedroom with the refined elegance of 510 Design's Josefina 8-piece Comforter Set. Showcasing a pieced design with quilting details, this ultra-soft microfiber comforter flaunts a printed damask motif in blue and brown hues to create a luxurious look. A solid brown reverse complements the top of the bed, while the matching shams reiterate the design of the comforter for a chic coordinated ensemble. The blue Euro shams feature brown flanges that add a charming touch and two embroidered decorative pillows provide a lavish accent. Completing the comforter set is a solid blue bed skirt that offers a clean finish, giving your bedroom décor a beautiful allure. This comforter set is exactly what I wanted! The colors are amazing and the set is well made. The shams and pillow cases are king size (in the king size sheet set). I would rather have standard size cases, but other than that I'm completely happy! This comforter set is just the thing to refresh my bedroom for Spring. It matches the decor perfectly. Colors are just as the look on the O website. It’s silky and luxurious. Bought this set for my mom - who is a picky mom. She LOVES it. Her favorite colors - not over the top in color...just right. She loved the fact too that it came with the dust ruffle and so many pillow shams and 2 pillows! 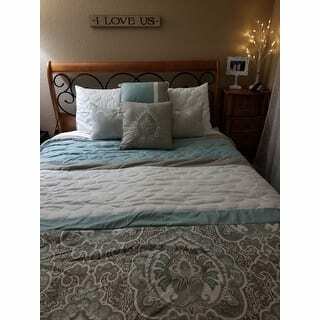 This 8 piece comforter set is so pretty and stylish. 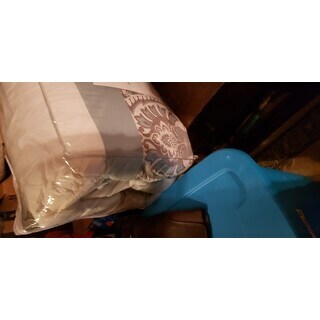 The comforter is very soft, a nice all season's weight, and high quality at an affordable price. I am so pleased with my purchase. I love the brilliant colors and the quality of this comforter set. It is very easy to take care of. It is light weight and easy to make up each day. I would recommend this comforter to use as a spring / summer bedding or to just give your bedroom a more lighted and cozy feeling. I love this comforter set. It brightens up our master bedroom without feeling too feminine. The brown is lighter than I thought, almost a light gray brown, it feels very high quality and perfect for a spring refresh! I love this set. 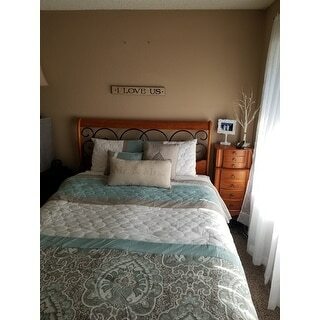 Very pretty, offers a light and clean look to the bed. I definitely recommend this. It easily fits our California king size bed. This comforter looks exactly as pictured and is sooooo soft!!! It doesn't wrinkle up easy, no filling balled up inside, and the fabric is very velvety to the touch. Absolutely perfect. Received this today and was amazed at the quality for this great price. It is exactly as pictured. Thanks for a great product. And received a day earlier than expected! "Is this grey or is it really brown like the description? I do not see any brown at all." "Is this gray or taupe or brown? Is it blue or turquoise?" The comforter flaunts a printed damask motif in blue and brown with a solid brown. I hope it helps.